TW560 has also been to Styria a few times and it has always been a very memorable trip. This year, my youngest daughter and I will make our way to Styria by TWIKE. 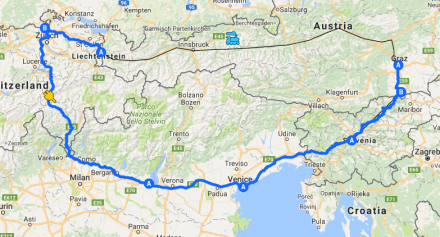 6 additional road-trip days in northern Italy and Slovenia, visiting Brescia, Venice and Ljubljana. I’ll heading back home Sunday night, whilst my family will stay on for another few days. The interactive map below allows you zoom and pan – have fun! As usual, I’ll be publishing travel updates every day and our exact GPS position will be shown on a map, updated every 5 minutes. Want to read about TW560’s first adventure this year? Start your TDAF2016 adventure here!